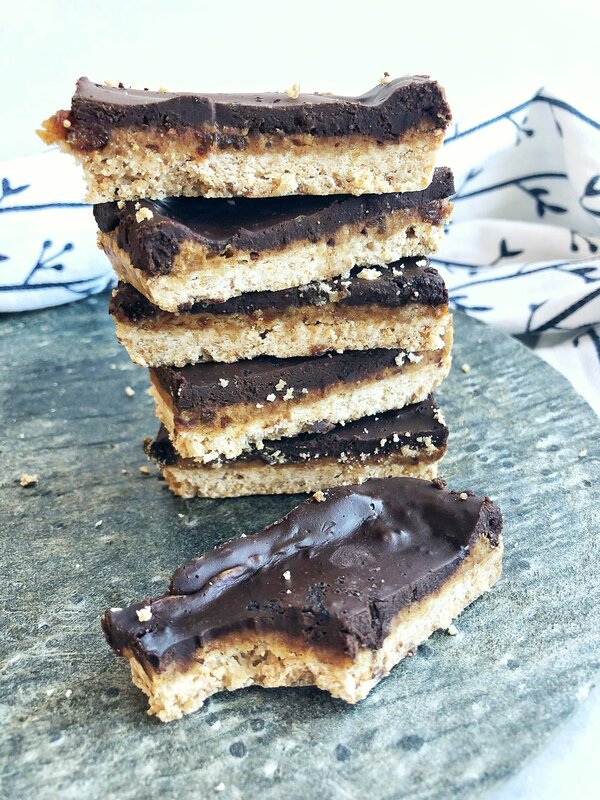 Buttery, crispy shortbread crust, smooth and creamy pumpkin caramel, and a snappy chocolate topping make these little bite-sized beauties the perfect sweet treat. Whip up a batch to share, or just to keep in the freezer for whenever you get a hankering. 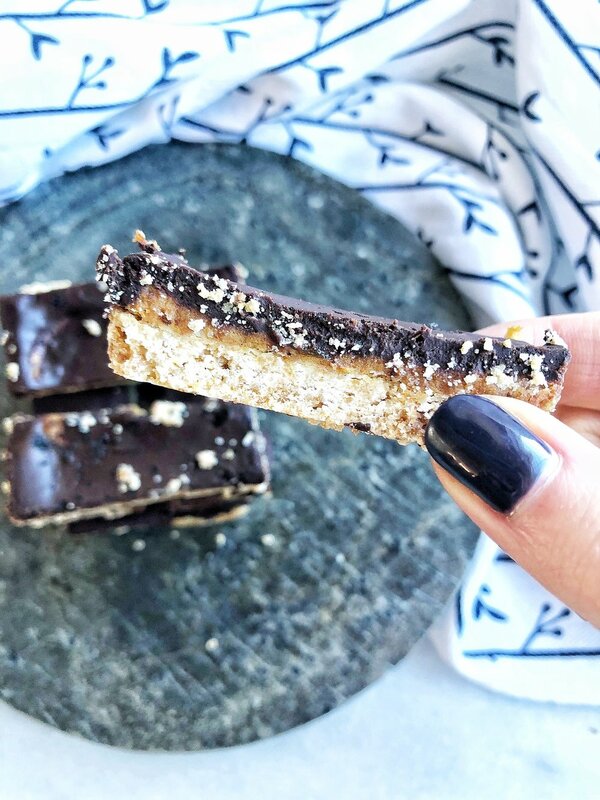 This recipe is actually the love child of two of my other sweet favorites, stealing the shortbread crust from my PB & J bars, and the pumpkin caramel from my Chocolate-covered Pumpkin Date Caramels. And a match made in heaven it is! All of these flavors marry together so nicely. Add these to your Thanksgiving table and wow your guests with the flavors of fall that we all know and love in a fun and palette-pleasing new way! Heat enough water to cover your dates, and soak dates for approx. 15 min. I do this in a glass measuring cup or bowl. Set aside. In the bowl of a food processor* (easiest option), add cassava flour, baking powder, salt, and sugar. Pulse to combine. *Alternatively, you can combine all ingredients in a bowl, whisk to combine, then incorporate step number 3 with a fork or pastry cutter. Add ghee, coconut oil, or butter. You want it to be solid, not melted (just freeze or refrigerate for a few minutes if it's not). Pulse slowly until just combined and forming a crumbly consistency. Don't over-mix! Bake for 12-15 minutes or until brown. Remove and let cool completely. Once cooled to room temp, place in the fridge to firm up. Drain water from your dates, remove pits if not already pitted, and add all filling ingredients (dates through sea salt) to the bowl of your food processor (I just rinse it out from the crust). Process until completely smooth. Remove crust from the fridge and add your pumpkin caramel mixture, using a rubber spatula to smooth and evenly cover. Refrigerate for 30 min or freeze for 15. In a small glass bowl, add your chocolate chips and coconut oil. Heat in the microwave in 30 second increments, stirring each time until fully melted and smooth. Keep a close eye to avoid burning your chocolate. Alternatively, you can heat a small pot of water on the stove and place a glass bowl into the top of the pot. Make sure it’s not touching your water or the bottom of your pot. Add your chocolate and coconut oil and melt, stirring until smooth. Remove bars from fridge or freezer and evenly spread your melted chocolate. Sprinkle with sea salt and refrigerate or freeze until completely set. Slice into desired sizes and enjoy! These bars will soften considerably at room temp, so they’re best stored in the fridge or freezer. Whether you whip up a batch of these to grace your Thanksgiving dessert table or just because it’s the weekend and you can, no matter the reason, these are the perfect little treat to have on hand simply for sake of enjoyment.